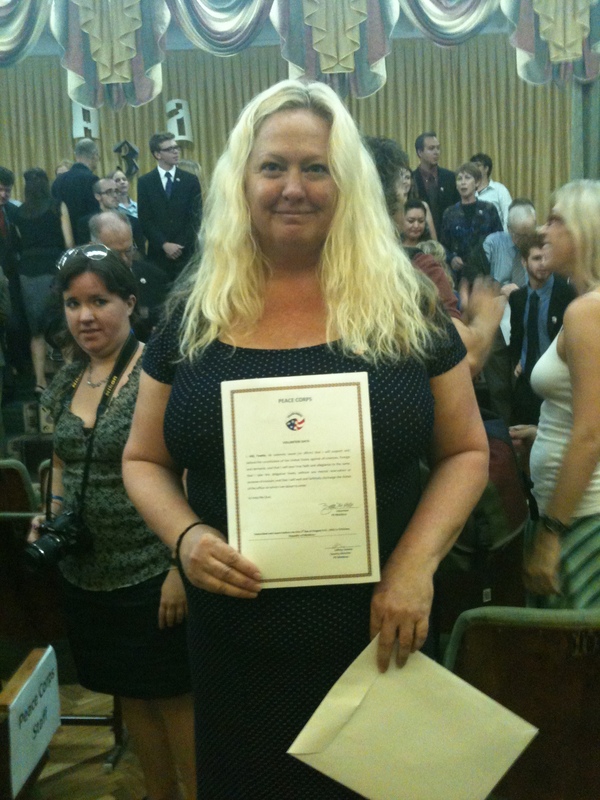 Holding my Oath of Office – I am a Peace Corps Volunteer! I confess that, as we repeated the same oath that – in various permutations – thousands of other Americans serving in the military, diplomatic service, political office and other agencies of government have taken, I did tear up. Being an American is a insoluble paradox for me. I left the country partly because I am so tired of its politics, its materialism, its narcissistic patriotism, its inability to transcend its own mythos. Yet it is America that brought me here, that sustains my work and the Peace Corps mission throughout the world, that continues to believe in “promoting peace and friendship” abroad through the voluntary service of over 200,000 of its citizens to date. As the Ambassador to Moldova William H. Moser said in addressing our group, we are the most effective ambassadors of the American people in 137 countries around the world. In searching for a YouTube video of my new site, Hîncești, I came across the following video. Made, of course, by a Peace Corps volunteer. Because I challenge you to search YouTube for a video made of ANY country in the last five years and not come up with one made by a PCV. This is what we do. We bring laughter, creativity, camraderie, esprit de corps, hope, friendship, diplomacy, and good will wherever we have been. And we share it with the world. Today, I am proud to be American. I’m very proud of you my friend. Congratulations! I am so very proud of you! In many ways you are a true example of being not only one realy awesome American but I am so very touched at your ability to bring a sense of Peace there through your work! God is within you and you are a flowing spirit Yvette! Love you so much! Your care package leaves on Wednesdayand will include some homemade goodies for your new digs :)).